Borderlinx | Buy Baur and ship worldwide with Borderlinx. Cheap rates guaranteed. Baur Germany is the best in mail order online shopping; offering convenience and providing detailed product information at your fingertips. For nearly a century, Baur Germany has been meeting a wide range of consumer product needs, from clothing to furniture. Baur Germany mail order evolved rapidly to web sales to meet customer demand, and about 70 percent of its orders are now processed through the website. With a commitment to the highest standards of service and quality, Baur Germany is your ideal destination for one-stop shopping. With a diverse array of goods, to include fashion for men, women and children, sportswear, lingerie, swimwear, evening wear, casual apparel, shoes, home accessories, electronics, sports and leisure equipment and furniture, Baur Germany makes online shopping quick and painless for everything you need. Baur Germany savings are plentiful, and alternative payment options, such as billing or installment payment plans make your purchases affordable. The Baur Germany website also supports a timely newsletter that alerts you to exclusive offers, freebies and attractive sales discounts. 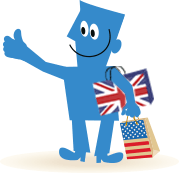 Online shoppers around the world can now purchase Baur in Germany with Borderlinx! Review the 6 easy steps to international shipping to 64 countries and then use our shipping costs calculator to determine how affordable it is to have your orders shipped to your home country. A number of services are available through Borderlinx to make international ordering from Baur Germany hassle-free, including shipment value protection, free repacking and consolidation services.